The Gir Forest National Park and Wildlife Sanctuary, also known as Sasan Gir boasts a large number of lions. The forest area in Gujarat is famous for a number of lion sightings, which when spotted by human beings seem wondrous and terrifying. However, such occurrences have become common in areas close to the forest. 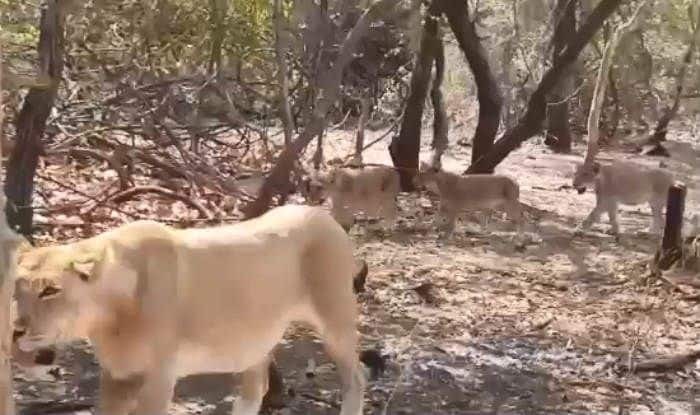 Recently, a video was captured by a tourist in which we can see nine lions trying to cross the street in the Sasan Gir area of Gujarat. The video seems to be quite fascinating as we can see a herd of lions taking pride of the road. In the clip, we can see 6 lionesses and three lion cubs crossing the road. The lionesses are known to be quite protective of their cubs, and this video is proof of that. The video shows 3 lionesses walking just before the three little cubs, followed by the other three lionesses. The tourist who captured the video on his mobile camera seems to be thrilled while shooting the unusual moment. There have been many such instances of lions taking pride of the streets. A few months back, a disturbing video of a lioness and three cubs being chased by a trucker had gone viral and had sparked an outrage on social media. The incident happened in the same Gir area in Gujarat. Following this, the forest department had promised an enquiry, but till date, no probe has been done. More awareness and information about protecting wildlife needs to be generated among the masses, and the offenders should be booked, in order to avoid such instances.